Today ends a week I look forward to and dread all at the same time. I love summer. I love freedom, sleeping in, reading all day, spending time with my boys, and time to recharge. As much as I abhor swimming suits, I love going to the pool. I enjoy swimming laps, reading poolside, and seeing former students. Summer gives me time to vacation with family, travel to conferences, and read and write with abandon. I also love teaching. I love my students – getting to know their personalities, watching them get excited over a book, and helping them find small successes in reading, writing, and life. And as much as I know we need a break – and we really do – I dread the end of the year. By May I always feel like we’ve formed a family – for good and for bad. We know each other well. We support each other and push each other to succeed. By this time of year we also are like a family of ten that has been trapped in a small log cabin for such a long, long winter. We’re ready to move, to grow outside of that cabin, to fly. It is time to move on, yet part of me is never ready to let go. Friday was a day of endings. Last reading classes. Last time to teach these big fifth graders I’ve come to love. Last time to talk with them about books and life – at least in the classroom. In my first class of the day, I knew I was in trouble. When I brought us to a close at the end and told them I loved them and was honored to teach them for this year, one girl began to sob. The chain reaction began. No matter how much I tried to say that we live in a small town, that I’d see them at the pool this weekend, that my son is in their class and I’d always be around, the tears flowed. A line formed and I hugged, and hugged, and hugged. They left, and I was a mess. Class two entered and did better. But when they left, and after another line of hugs, I found letters they had left me. Beautiful letters. Letters that ended with sentences like, “So, I love you (not in an awkward way. )” That might be the perfect fifth grade sentence. My own tears returned. My class came in. I informed them there would be no more tears. I’m still with them until Tuesday. And we celebrated. After school – and after a retirement party for some amazing teachers – I headed to the pool. It was exactly what I needed. While sitting in a chair poolside for two hours I talked to former students who are in sixth grade all the way through seniors in high school. They eased my sadness and reminded me that I’m truly blessed to live in a town where goodbye is not forever. So, today I celebrate my students. I celebrate their reading this year. I love this activity below. We do a lot of talking about how this is not a competition, except against yourself. I want them to become readers. Some came to me that way; many became readers over our year. I don’t really care what their "number" is, and truly, they don’t either. I care that they know who they are – what they like, what they don’t, and can describe that. I care that they talk to their friends about books. I care that they make plans for what they're reading next. I care that they want to read over this long summer. These faces are what make my job worth it, and I will miss them more than I can say. Enjoy our video. A few days ago I posted a blog about boys and reading. I was a bit frustrated by the message being sent out in the media that boys don’t read, when I have found the opposite to be true. Of course, some boys don’t read – but some girls don’t either. What I have found to be true over eighteen years of teaching is that when a student of any gender doesn’t enjoy reading, they are usually either struggling with their actual reading ability, or haven’t found a book to hook them yet. In the comments to my blog post I had a reader ask for advice. Her younger son isn’t a reader. I mentioned that maybe I should write out a timeline or post about my own sons and their progression as readers, because each got there in their own way. This is that post. I have two sons – Luke is eleven and in fifth grade. Liam is nine and in third. They are very different in every way, including reading. They both encountered roadblocks in route to becoming readers, but would now identify themselves as readers if you were to ask. Reading came relatively easy to Luke. I’m sure he was never at the top of his class in reading, but we never worried about it. He could read anything his teachers sent home, memorize any list of sight words, but he didn’t love it. I found that Luke reminded me of many of the boys that entered my room in the fall when I taught fourth grade. They just didn’t see books that interested them. They’d read a book flawlessly, summarize it beautifully, but not find any connections or joy in the act of reading. With Luke, I had to search. The Diary of a Wimpy Kid series began to pull him out of his reading rut in second and third grade, but it was The Lightning Thief that really turned things around. Towards the end of second grade he begged me to let him read it. I knew that it was far above his reading level. I could have told him to go ahead and try, but I didn’t want him to be discouraged. Instead, I got the book on audio and asked him to follow along as he listened to it. He was mesmerized. We talked about Percy, why he made the choices he had, and Luke talked about what he would have done. From that point forward, he began to identify as a reader and hasn’t looked back. Liam had a tougher journey to reading. He had a severe speech delay that made the words he said and the words on the page form a mismatch. Decoding was tough. Fluency, forget about it. (Spelling is another post entirely.) But, we persevered. In first grade Liam’s amazing teachers talked to me about his reading. He was performing well below his peers and already receiving Tier 2 services for RTI. They suggested he continue with that, but also get some Reading Recovery help. I was all for it. Liam did a lot of reading work in that first grade year, but we had ground to make up! Each night he dutifully read his reading class homework, his Tier 2 homework, his Reading Recovery homework, and did any work that went with them. We also made sure to add “fun” reading in there as well – often something from the Elephant & Piggie series where we could act out the voices. While it was a lot of reading, Liam needed to close a gap and he wasn’t going to do that by reading the same amount the rest of his peers were. In one year, he caught up. In second grade, he found graphic novels – thanks to some Babymouse books I had lying around – and took off. He tore through every graphic novel I owned in second grade. In third grade he found Big Nate and Diary of a Wimpy Kid. I think the format of the books with less text on the page helped him feel successful. Liam reads all of the time, typically at least an hour a day (as does Luke – by choice, my request is twenty minutes) and always without prompting. He is now far ahead of where he needs to be grade level wise, but truly that isn’t what matters to me. He loves to read. Beyond having the expectation that my kids would read and providing them with materials, there are just a few other things we’ve done that I think matter. As someone mentioned in the comments, they see me reading. They see my husband reading. They know my parents are readers and they often ask what the boys are reading (and my mom reads the books they do so they can talk about them.) They’ve seen me curled up in bed, reading See You at Harry’s and sobbing as I read. When they asked why I would continue with a book that made me cry, I replied, “Sometimes a book is so beautiful, so moving, that it reduces you to tears, and you read on in spite of that.” They will both read that book one day because they want to understand why. I talk about how books make us better people and point that out in my own books. I ask them what they’ve learned about themselves from the books they read – how did they grow? And I ask them to give me feedback on the books I buy for my classroom. Whenever picture books arrive at the house, they often beat me to reading them. I’ll ask them what they thought of it, how I could use it in the classroom, etc. When Bluebird arrived last year, Liam read it after I did. I was still wiping away tears when he closed the book. I asked if he thought Bob Staake should have changed the ending. Liam flipped to the page where the boy is holding the bird with the bullies surrounding him. He said the book needed to be the way it was because, “Sometimes kids need to know that sorry won’t fix what you’ve done.” And then he said, “That’s what you need to teach your students, Mom.” Yep. I guess some kids are just born readers, but mine have evolved to becoming one. I think all of our paths to reading are different, but I’m convinced that if we find the right books, give them time, allow choice, and talk to them about what they read, we are helping create the next generation of Nerdy Book Club members. Ever since Luke was born, I’ve been on a mission. I take photos of everything. This only intensified when we had Liam. I have the world’s worst memory, so I attempted to take a picture of every moment that I wanted to remember. What I’ve learned along the way is that photos do help, but some memories don’t necessarily need photo documentation to be recalled, they must be burned in my mind somehow. I think Saturday night is one. We attended the wedding of Todd and Jill. Todd is one of Chris’s cousins and I’ve known him since he was six. It was an amazing wedding and reception. Even so, around 9:30 pm, Luke and Liam told me they were ready to go, they were exhausted. I was grateful that the hotel rooms were in the same hotel as the reception, Chris was with his brother, so the boys and I headed to the room. Immediately upon arriving in the room, I sensed one boy – who will remain nameless here – was sad. When pressed, he admitted that he had wanted to dance, but didn’t know how. It’s interesting to me that as we age, we become more censored. Both of my kids were willing to dance in front of anyone growing up. At family dinners we were often treated to them jumping around and dancing as we ate. Apparently as they have grown they’ve worried they don’t dance “right”, whatever right may be. I looked over quickly and explained that the only thing you need to dance is the desire to actually do just that – dance. No one knows what they’re doing, they just move to the music however makes them happy, and that’s it. I asked if they wanted to go back to the reception, and both shook their heads. They really were beat. So then, I grabbed my iPhone, turned on shuffle, jumped off the bed, and invited them both to dance. It took some convincing, but after a few seconds our hotel room was a dance party. While timid at first, both kids warmed up and were dancing up a storm. We talked, danced, and sang. Ten minutes later, we collapsed, laughing, on the bed. No photos are needed for this memory, it is firmly implanted on my heart. 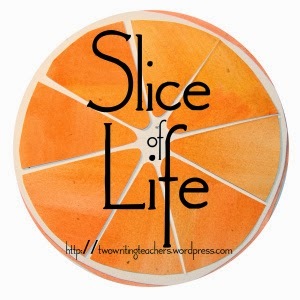 Slice of Life is sponsored on Tuesdays by Two Writing Teachers. For the month of March we are posting a slice each day on our blog. Join in! Every once in awhile I read an article or see a headline lamenting the fact that boys are in crisis because they don’t read. I’ve seen all sorts of “reasons” for this – video games, sports, you name it. I remember hearing Donalyn Miller in a presentation once address this issue. She said something like, “Boys don’t read? Don’t tell my boys that.” I couldn’t agree more. I have three boys in my house – Chris and our sons. Chris reads, but will always say that he is not a reader like I am. I disagree. He is a reader, one look at the table on his side of the bed tells me that. Chris is an avid comic book reader, an occasional book reader. When he does read books, he reads compulsively. This winter he polished off as many books as I could throw at him, but then will go months before picking another one up. It works for him. They also are expected to read, and they do, daily, even on vacation. I talk to them about books all the time. I ask them about what they’re reading, what they like about the book, what the characters are doing, etc. My boys are blessed, yes, by parents who can afford to buy them books. But they have become readers because we have worked to make sure that happened. Boys don’t read? In my family they sure do. Even in my classroom, they do. This year I have 79 fifth graders for reading. Out of that 79, 42 are boys. All of them read, many are avid readers. How do I know this? Boys rushing to meet me when I arrive at school to confer, asking about a book, or begging to be first in line in a new book. Conversations in the hall, in reading, on our way to lunch. Messages left on post-its stuck to my laptop. Or, when I’m lucky, I get an exchange like the one below. A little background – these texts are from my student, Hayden. Most students don’t have my cell number. Hayden’s mom and I are friends, so he’s on her phone. Our class read aloud was The False Prince. I had told Hayden he would love it. Starting it, I was confident he would find another copy and finish before I ever did, and he did just that. He moved on to the second book while I was still reading the first, and then the third. These texts came over the course of a week in which he read the second, started the third, got worried over a plot point, and then finished the series. I told my husband as I texted Hayden back while we drove up to Minneapolis this weekend, I wish I could confer with every student on my phone when we aren’t at school. I think the loss of privacy would absolutely be worth it. So, yes, boys read. When I see those articles I am frustrated and I wonder – why are “some” boys not reading? Are we not giving value to their chosen format? Genre? Ways that they want to respond? How can we meet them where they are and help them to grow? I think the best thing we can do to ensure our boys are reading – heck, that boys AND girls are reading – is to get to know each child, what makes them tick, what they love, and build those relationships. Boys don’t read? Don’t tell my boys that. Sidenote: while typing this entire post, my son, Liam, has lay in the bed next to me, reading. I've asked him to stop and go to bed several times only to be met with, "Let me finish the page I'm on." over and over and over. I could have just recorded our conversation in lieu of writing this post. Here lies the perfect response to "boys don't read."